Today I got out Basket Bunch and matching Basket Builder Framelits Dies again to make a general purpose greeting card. I decided to use Daffodil Delight with a Basic Black accent. Each time you put together the basket, it turns out different. You can see that each card has just a little different arrangement of flowers. This is basically an Easter set, but it includes sentiments and elements that make it a perfect for making general Spring cards. The grass is Old Olive and the basket is Chocolate Chip backed with Crumb cake. Both are cut using the Basket Builder Framelit Dies. Tip: On the first card on the left, I mounted all of the elements on a small rectangle piece of Whisper White before I added it to the basket. It seemed to make it easier to "arrange" the flowers and sprigs of leaves. On the second card, I attached flowers and leaves directly to the back of the basket and found it a little more difficult to "arrange" the flowers. I recommend mounting flowers on a circle or oval before mounting them to the basket. Paper: Whisper White, Daffodil Delight, Old Olive, Chocolate Chip, Crumb Cake, Basic Black. Eight days remain if you want to take advantage of the Sale-A-Bration promotions or special demonstrator sign up promotion. Popular Sale-A-Bration selections have already been depleted, as the Sale-A-Bration promotion nears its end. The card tins and the 6 X 6 Glimmer Paper are gone. 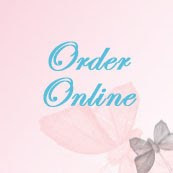 However, there are still many cute selections you can order free with each $50 you order. Stampin' Up! announced three waves of free selections you can get with each $50 to ensure you'll find something you'll love. See the web post I sent earlier with the listing of these latest selections. Stampin' Up! will open their system shortly allowing demonstrators to pre-order and send new catalogs to their customers in late May. 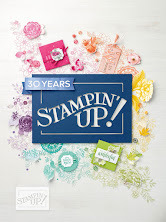 If you've ordered from me during the past 6 months, I'll make sure you receive new catalogs at the earliest possible release date by having them shipped directly from Stampin' Up! to your address on file. However, if you've check "no communication" during your last order, I do not have access to your address to send you catalogs. 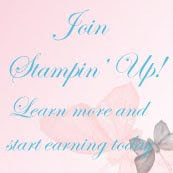 Log into your Stampin' Up account and check your communication status, now, before Stampin' Up! 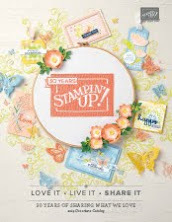 allows demonstrators to ship catalogs directly from the Stampin' Up! mailing house to your address.